Not all of HMAS Sydney’s 645 men went down with the ship and were lost. 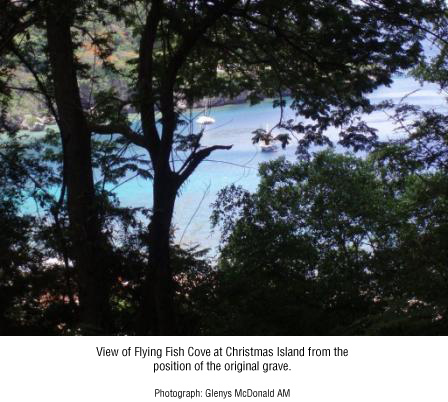 On 6 February 1942, over two months after HMAS Sydney’s loss, a Carley float containing the body of one of her men was seen drifting off Flying Fish Cove, Christmas Island; the float was recovered and the body later interred in the Old European Cemetery with full military honours. Some weeks later the Island was occupied by the Japanese for the duration of the war. The grave was never more than a mound of earth that gradually disappeared under material washed down from the escarpment above and any means of identifying the man, including the exact location of his grave, was lost until successfully investigated more than sixty years later. 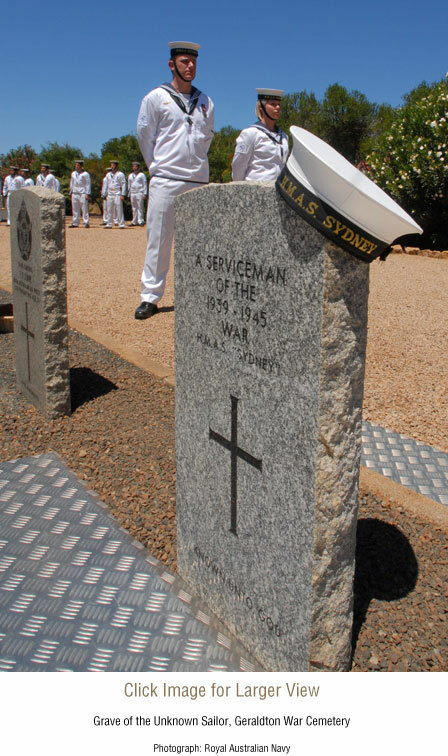 Nevertheless this unknown man, the only member of her Ship’s Company to be found, became the anchor for honouring the memory of all of the brave men who laid down their lives in HMAS Sydney's last battle. 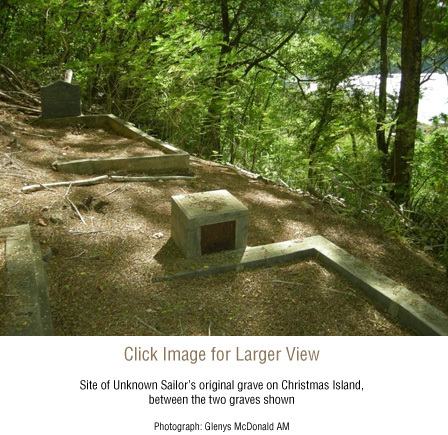 After many years searching, the grave site on Christmas Island was found in 2006 and the body was exhumed and examined but, so far, not identified. The records of some 300 men went down with the ship. 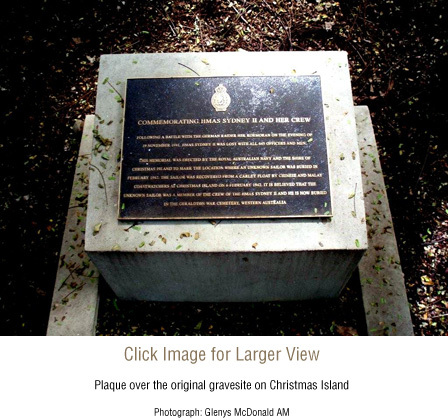 The man was re-interred with full military honours on 19 November 2008 at the Geraldton War Cemetery, Western Australia. 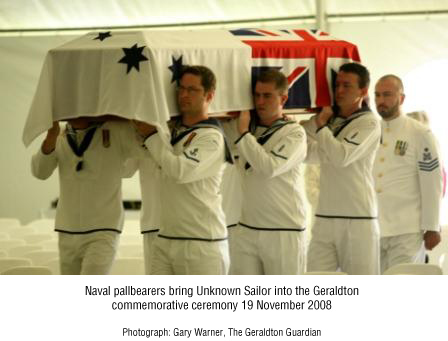 The Unknown Sailor continues to serve his country by enshrining a nation's love of peace and to remind us that, in the sacrifice of the men whose names are recorded here, there is faith enough for all of us who remain. We do not know this man’s name but hope that one day we will. We do not know his rank or what his duties were. We do not know for certain whether he was a sailor, airman or civilian. We do not know where he was born, or precisely how and when he died. We do not know where he had made his home or when he left it for the Service. We do not know his age or his circumstances; whether he was from the city or the bush; what occupation he left to serve his country; what religion, if he had a religion; if he was married or single. We do not know who loved him or whom he loved; if he had children or which of us they are; but we do know that his family is one shown on this Memorial so he is not lost to us as he was lost to them. He may have believed that War would be an adventure too grand to miss or he may have joined up because he believed it was the duty he owed to his family, his country and his King. We know that he sailed in HMAS Sydney, tasting triumph and disaster as one of 645 Shipmates who died in her battle with HSK Kormoran on 19 November 1941. Unknown, he is all of them and he is one of us. 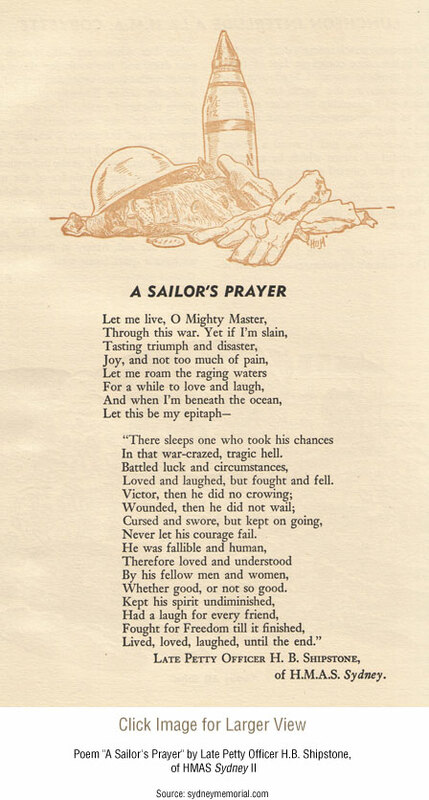 This Unknown Sailor did not die in vain for his sacrifice reminds us that these were not just ordinary men but the heroes of that war; who taught us to endure hardship, to show courage, to be bold and resilient, to believe in ourselves, to stick together. That is surely at the heart of the Sydney story and the Australian legend which emerged from all wars. It is a legend not of sweeping naval victories so much as triumphs against the odds, of courage and ingenuity in adversity. It is a legend of free and independent spirits whose discipline derived less from military formalities and customs than from the bonds of mateship and the demands of necessity. It is a democratic tradition that makes us Australians.